Following Gwennie’s ascent into the flotilla of Ormond Stirling Saranyu as a Lottery Winner, Wendig introduces us to Gwennie’s new protector, Balastair, and are slowly introduced to the rest f the Empyrean cast. We also start to get some hints of what happened to Cael’s sister Merelda. And it’s quite an interesting story, too. We also get to learn more about the world of the Heartland and Empyrean. Some of the history and the secrets come to light during Cael’s journey. The reasons why the world is the way it is are pretty well constructed, and they add wonderfully to the (urban) mythology of Wendig’s world. 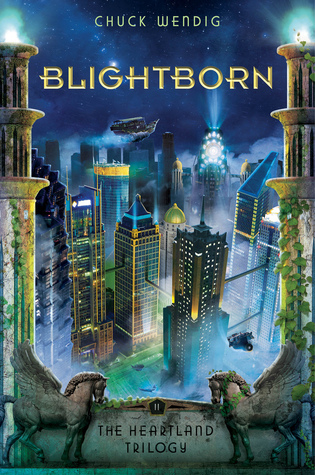 I would say Blightborn is an improvement on Empyrean Sky, instead of the slump that many middle books in a trilogy tend to be. The action ramps up, but it’s not filler. There are no training montages or sitting around waiting for the enemy to make a move. Wendig has created one of the more proactive dystopian MCs in a long while, and he takes full advantage of it. Now, with all that said, there are some things that are not so great about the book. For example, Wendig still hasn’t really explained the reason for the Obligation ceremony. The ceremony serves to drive much of the story, both in the form of the conflict over Gwennie between Cael and Boyland, and in the character arc of Wanda. The idea of the Obligation certainly provides some convenient tension and motivation for Wendig’s characters, but it’s rather unclear why the Empyrean have imposed it on the Heartlanders when their own society is so much more free in terms of sexual and romantic relationships. Perhaps Wendig has some answers, but he hasn’t seen fit to share them with his readers, and I found it a bit frustrating. Something of a bit more controversial nature is the relationship between Merelda and her friend from the Provisional Depot. I won’t spoil it here, especially this close to publication, but it’s something that would certainly push this towards the 14+ crowd if you went by the standard media ratings systems. I haven’t actually decided how I feel about it. It fits with the way many teenagers think, and it creates one of the most interesting sources of tension in the novel. But it did make me rather uncomfortable in a way not a lot of YA books do. In some ways, that’s actually a compliment to Wendig. If I just hated it, or wasn’t at all bothered, it wouldn’t be nearly as powerful of a situation, and it would probably mean it was just handled poorly. My final nitpick has to do with a world-building issue. Considering the technology obviously available to the Empyrean, it seems a bit odd they would have so much trouble creating the pegasus that drives so much of the first part of the novel. They Empyrean clearly has access to some incredible genetics and bio-engineering technology, as you’ll see if you read the book. So why do they find this one issue so difficult? I note this as an example of the cracks that run through Wendig’s world-building. As long as you are pulled along by the story itself, and keep turning pages, you might be able to ignore these cracks. But for those who do care a bit more about the world-building aspects of the story, I want to be honest about my feelings on this issue. Still, despite a few reservations, I did enjoy this book, and I’m sure there are many others who would also enjoy it. I can’t say everyone should go out and buy this book right now, but neither can I let anyone dismiss it out of hand. Certainly, anyone who enjoyed the first book in the series will find this a worthy successor. Chuck Wendig is a novelist, screenwriter, and game designer. He’s the author of BLACKBIRDS, DOUBLE DEAD and DINOCALYPSE NOW, and is co-writer of the short film PANDEMIC, the feature film HiM, and the Emmy-nominated digital narrative COLLAPSUS. He lives in Pennsylvania with wife, taco terrier, and tiny human.